Guide to Minnesota, Illinois and Wisconsin Wineries and award-wining Midwest wines from Alto Pass, Galena, Roselle, Pomona, Galesburg, Grafton, Roselle, and, Cobden, Illinois. NEWS UPDATE: The Upper Mississippi River Wineries designated as the largest regional AVA in the USA. Need another good reason to 'hit the Great River Road?" Wineries along the Great River Road will be celebrating one of the best grape harvests in the valley this year. We offer a list of Great River Road Wineries HERE. To visit the "original" German wine trail, share in our visit to Hermann, Missouri HERE. "This is a Midwest niche market," Mark Renzaglia tells me as we sit near the vines at Alto Pass. "The Midwestern wineries are not competing with the California wines, for example. It's hard to compete with traditions already firmly established--the traditions of places like France, California, Italy or Australia. We compete very well with the Missouri and other Midwestern wineries." Click on a green grape (or one of the towns above) for name, address, and phone number of a fine Illinois winery nearest your home or destination.. Wineries in Minnesota, Iowa and Illinois can be found below under GREAT RIVER ROAD. Visit the Mississippi River Home Page at www.greatriver.com for more on travel, recreation, and history along the Mississippi River. New! Email us at gcwinery@galenalink.com and visit our website at galenacellars.com ! Located in the historic lead mining town of Galena, IL. Open daily at 9 am except major holidays. Family blends, ferments and ages, 18 award winning table and fruit wines. Offers tasting, tours and a wide array of wine accessories. Visit Boone's Restaurant on second floor featuring our Galena Wines. NOW OPEN - The Vineyard Tasting Room, open Fridays, Saturdays and Sundays - June - October. Relax on the deck and enjoy a glass of wine and our spectacular panoramic country views. Travel Tip: Historic Galena, Illinois, presents an architectural pastry to the traveler. The beautiful Victorian homes of Galena are open to the public as bed and breakfast inns and a plethora of antique shops. The home of Ulysses S. Grant is open for tours. Our winery is located approximately 35 minutes from downtown St. Louis on Illinois State Route 3, just 1/2 mile west of Red Bud in historic Randolph County. Sample the wines in our tasting room, tour the wine cellar or sit in the rocking chairs on our wide front porch and enjoy a glass of our wine. All wines are made in our wine cellar. Etched wine bottles and personalized labels are available for all special occasions. Look for hand painted wine glasses and ostrich eggs by a local artist in our gift shop. Also DISCOVER! Guides, homemade crafts, candles & gifts. Hours: Wednesday - Saturday 10 a.m. to 5 p.m.
Travel Tip: This area is rich in French heritage. French immigrants settled Red Bud around 1835 followed by German immigrants around 1850. Red Bud was an important stop on the stagecoach line between Belleville, Kaskaskia, Chester and St. Louis. The first state capitol of Illinois (Kaskaskia) is located in Randolph County along with the Fort de Chartres Historic Site. We are located in the Southeastern Illinois countryside amid the low rolling hills of the old orchard country of Richland county. Once the center of the apple and peach growing industry, this area is ideal for the growing of French-American hybrid wine grapes (with one major reservation--late Spring freezes). The soils and the intense summer heat allow the making of wines with very pronounced fruity flavors. Our hand crafted wines are produced without fineing, stabilizing, or the use of ion exchange resins. Filtration is done sparingly so as to retain the natural aromas and flavors.Please take a moment to browse the pages of our site and familiarize yourself with the fine wines we offer. Once you find one to your liking, click the "Order Form" link to the left of the screen. 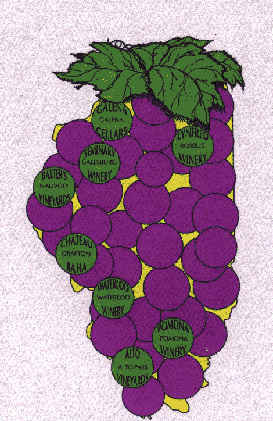 The Pomona Winery, located deep in the Shawnee Forest west of Pomona, Illinois, specializes in award winning wines made from southern Illinois fruit. The tasting room and picnic areas in a beautiful sylvan setting are open daily. April through December: Mon-Sat. 10 a.m. to 5 p.m., Sun. 12 to 5 p.m., March: Weekends only. Directions: Take Hwy 127 to 4 miles south of Murphysboro or 4 miles north of Alto Pass and follow the signs. Travel Tip: The River to River Trail from Grand Tower to Battery Rock on the Ohio River is a hiker and horse rider's dream! Considered to pass through some of the most spectacular scenery in the Midwest. There are seven "wilderness trails" throughout the Shawnee National Forest. Special Events: October 14-15, 2000 Octoberfest Festival at the Pomona Winery. Food, Wine and Music! November 24-26, 2000 Holiday Open House at the Pomona Winery. Wine tasting and release of new wines. Visit Little Germany in the Heart of the Illinois Ozarks! Taste award-winning wines, like dry white Cave Creek and sweet White Oak Port, or Honey Blush--unique to Von Jakob Vineyard. Enjoy our new 1200 square-foot Atrium (spring 1999), Tasting Room and Gift Shop year around. Bring a picnic lunch, sit on our deck, walk through our vineyards to the pond. We know you'll find us a great place to relax and get away from it all! Hours (year around): Thursday, Friday, Saturday & Monday, 10 a.m. to 5 p.m.
Travel Tip: The Pomona Natural Bridge Recreation Area offers just one of many nature trails set in the hills and hollows of the Shawnee National Forest. A short .3 mile foot trail leads to a 90-foot natural bridge that arches 25 feet above a small stream. Call 618-658-2111 to request maps and other info. Travel Tips: Alto Pass is the home of the famous Bald Knob Cross, with antique shops and a Bed and Breakfast. Surrounded by the Shawnee National Forest with great hiking, sightseeing, hunting, horseback riding and biking. Owl Creek Vineyard was established in December 1995. It is located in beautiful Southern Illinois, 4 1/2 miles south of Giant City State Park, near Carbondale. January to April, noon to 5 p.m. Saturday & Sunday or call ahead for an appointment. DIRECTIONS: From Carbondale, Illinois, take US Route 51 south toward Anna. At Mile Marker 16.55 turn east (left) onto Water Valley Road. Go 2 1/2 miles staying to the right at each fork. Travel Tip: The Makanda boardwalk craft shops, regional antique stores and bed and breakfasts, fantastic hiking trails and scenic countryside surround the winery. Winghill Vineyard and Winery, the newest winery on the Shawnee Hills Wine Trail, is located in a large red barn and features a tasting room/gift shop that is combined with an art gallery for talented local artisans. Winghill is home to over twenty peacocks of the India Blue and pure white varieties. Wine selections are made from chardonel, niagara, vignole, chambourcin, cynthiana and concord grapes, all of which are grown on our 6.25 acre vineyard. Travel Tip: The towns of Jonesboro and Anna are located south of Cobden. A marker at the Historic Fairgrounds in Jonesboro commemorates the third of seven debates between Abe Lincoln and Stephen A Douglas in 1856. More Wineries along America's Great River Road! Enjoy a wide variety of grape wines from over 10 different varieties of our own grapes, as well as strawberry, cherry, cranberry, and mead (honey) wines. Extensive half-hour tour of winery & underground cellars. Wine tastings. Open daily from April thru December 23, 10 a.m. to 5 p.m. and weekends from February thru March. Located between Muscoda and Highland on County Hwy Q.
Columbus Day Weekend! Home of the Ruby Lady. Tastings, Gift Items, Shipping UPS. Travel Tip: Historic Lanesboro, located among the bluffs of the Root River, anchors the western leg of the Root River State Bike Trail. The trail is used by bikers and hikers during the summer months and snowmobilers and skiers during the winter. Shuttles are available to both bikers and canoers on the Root River.